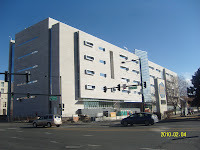 In Mid-April, 2010, the new Denver County Jail will open for business. It is part of the larger justice center that is one block to the west of the City and County Building. A small group of individuals has been given the opportunity to spend the night in the jail prior to its opening. So, on April 10 around 4:30 P.M., I will get booked in and spend the night in one of the minimum security wings. I believe they will feed me dinner, let me tour the facility, turn the lights off at midnight and offer to provide me with a free jailhouse tattoo (I am not certain about that last one...). With good behavior, I will be r eleased the next morning around 7:00 A.M. Although a little on the artificial side, I think it will be good to approximate the experience a large majority of my clients have had.